Download AnyTrans for Android to Start Android Contents Management Experience! Welcome to AnyTrans for Android Online Guide. Here you can find all detailed tutorials about how to manage your Android contents between Android devices, Android device & computer as well as moving iOS device data to Android device directly. If you still have questions after reading this guide, please do not hesitate to contact our Support Team, and you will receive reply within 24 hours. When you switch iOS device to Android device, transferring iOS device data to Android device is easy with Android Mover feature. 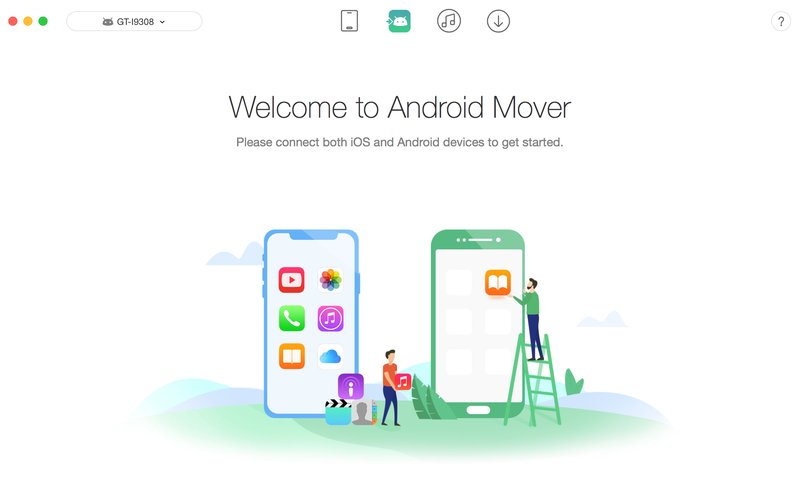 It provides a simple method to help you transfer data from iOS device to Android device with a few clicks, including Music, Audiobooks, Videos, Photos, Contacts, Messages, etc. Please refer to the detailed guide to make good use of AnyTrans for Android. Once your Android and iOS device are recognized, the main interface will display. 1. If AnyTrans for Android fails to recognize your Android device, you may try these troubleshooting steps to solve this problem. 2. If AnyTrans for Android fails to detect your iOS device, you may solve this issue by the following troubleshooting steps. ① Please download the latest version of AnyTrans for Android. ② Check whether your USB cable is loose. If it is, please reconnect it. If USB cable is broken, please give new one a try. ④ Please log in your computer as Administrator account. The supported types of files will be listed automatically. And you can choose all kinds of files you want to transfer based on your needs. 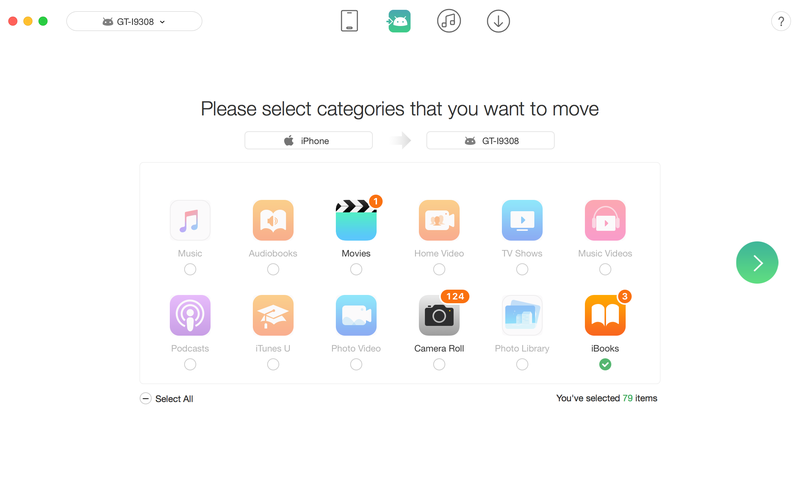 For some data that Android device doesn’t have corresponding data app, like iTunes U, TV Shows and so on, these data will be saved in Music or Video App on your Android device after finishing transferring process. After clicking button, the transferring process will start. The transferring time may vary based on the size of your data. Please keep patient. 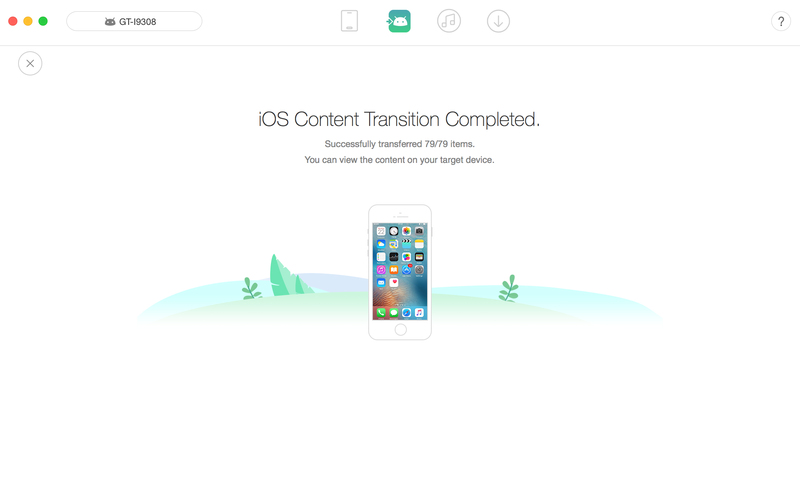 When the transferring process finishes, you will see iOS Content Transition Completed page. To locate the transferred files, please check them in your Android device. To go back to the main interface, please click button.